ANAHEIM, California – Coors Brewing Company presented a $35,000 gift to the Hispanic Association of Colleges and Universities (HACU) for scholarships for students attending HACU member colleges and universities. Coors Brewing Company presented a check to HACU during HACU’s 17th Annual Conference in Anaheim, California, this month. Coors Brewing Company was a conference sponsor. “HACU applauds the generous support from Coors Brewing Company for this new scholarship program, which ultimately will increase diversity in the country’s fast-growing health care professions,” HACU President and CEO Antonio Flores said. “Coors Brewing Company is a long-standing partner with HACU in efforts to help students who represent the country’s youngest and largest ethnic population to achieve their college and career goals,” Flores said. Coors Brewing Company earlier this year provided $125,000 in scholarship funds to HACU for the Coors Light Academic Success in Education (CLASE) scholarship program for qualified students from the United States or Mexico attending HACU member colleges and universities. Coors Light teamed up with the rock-en-español group Maná to fund the scholarship program with proceeds from a 13-city U.S. concert tour by Maná in 2002. HACU represents more than 350 colleges and universities which collectively serve the largest concentrations of Hispanic higher education students in 26 states and Puerto Rico. HACU’s international membership includes leading higher education institutions in six countries in Latin America and in Spain. Coors Brewing Company is the principal subsidiary of Adolph Coors Company, the third-largest U.S. brewer and the world's eighth-largest brewer. 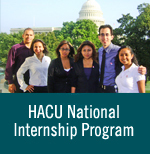 HACU’s 2004-05 scholarship application and program eligibility requirements will be posted on the “Student Resources” page at www.hacu.net in early 2004.